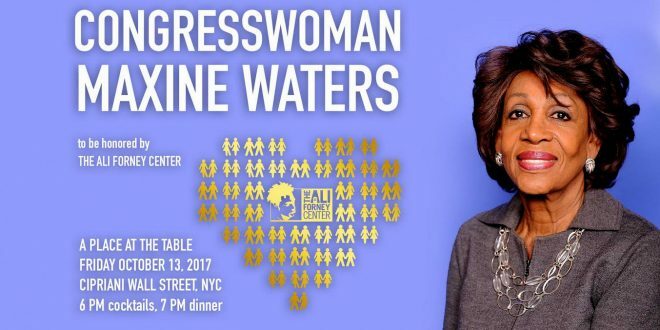 FRIDAY: Tituss Burgess To Host Ali Forney Center 8th Annual Gala, Honorees Maxine Waters And Lady Gaga - Joe.My.God. Friday the 13th at 6pm, the Ali Forney Center (AFC) will host the 8th annual A Place At The Table gala, an event that has raised millions of dollars to support a host of vital services including shelter and medical care for the homeless LGBTQ youths at AFC. This year also marks 15 years since AFC was founded, and, tragically, 20 years since its namesake Ali Forney was murdered on the streets of Harlem. A Place at the Table is AFC’s largest benefit serving to raise funds for AFC’s shelter and housing program. Over the past 12 months AFC has reported a 20% increase in the number of young people being kicked out of their homes due to homophobia, transphobia, and family rejection. Honorees this year include: Lady Gaga, her mother Cynthia Germanotta, Congresswoman Maxine Waters, Born This Way Foundation (BTWF), BTWF’s Executive Director Maya Enista Smith, and American Airlines. Get tickets here. I’ll be there!